Firstly, thanks for the JSF support! One more reason to love IDEA. 1. I18N doesnt seem to be supported yet (see attached screenshot). 2. Datatable variables are not resolved (see same screenshot). How 'mcsmsg' defined (something like <f:loadBundle var="mcsmsg"/>)? If yes then both issues should be fixed in next EAP build. Yes, in a loadbundle ! If your backing bean extends another java class, then the properties in the base class are not recognized in the .jspx (highlighted in red). OK build 5218 looks MUCH better !! However, I'm still getting one small problem.. Look at the attached screenshot. You'll see a property is not recognized in one attribute, yet it is recognized in another slightly above it. It looks like the problem is specific to the "rendered" attribute. OK, Build #5231 has some redness in the for= attribute too. See screenshot. Apparently not in #3245. Still problems with the for= attribute. Screenshot attached. Unfortunately, the JSF spec requires the scopes to be all lowercase. 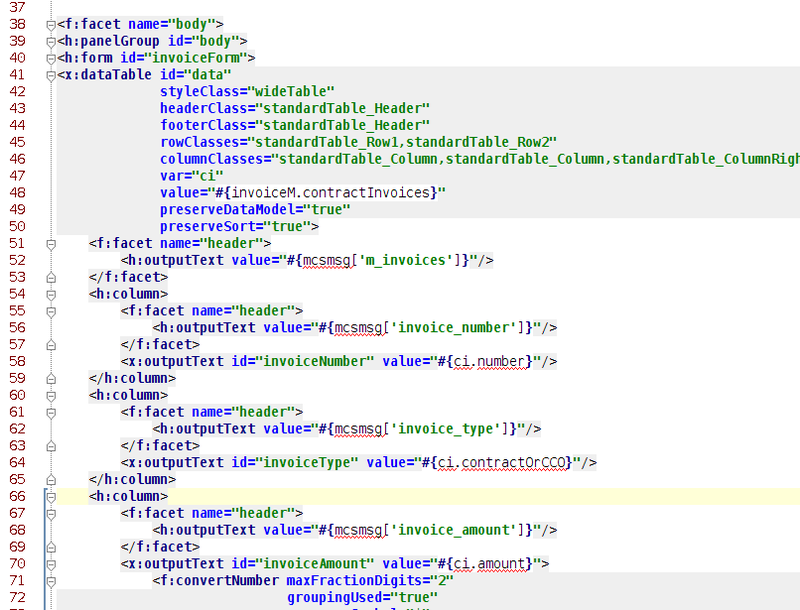 Does this happen during editing xml or using visual interface?